Fast forward about 15 hours and I met up with the Skytypers team at their NASCAR style hauler near the hot ramp at Quonset Point. The impressive trailer follows the team around the country for airshow season and contains spaces for spare parts, a shop for repairs, a flight equipment room and a briefing area outfitted with all the conveniences one would need. Prior to the flight, each rider was outfitted with a flight suit, helmet and the necessary evacuation equipment including an inflatable life jacket and parachute. In addition, slot pilot Chris Orr provided a briefing regarding strap in, radio/intercom procedures and evacuation procedures ending with the distribution of airsickness bags. While the Skytypers are not in the business of making their passengers sick, it has been known to happen and its better safe than sorry! After being prepared for the flight, it was time to step to the planes. After a short walk, I was alongside the SNJ-2 with a cowling adorned with the large white number 2 flown by Chris “CT” Thomas in the right wing position in the formation. After putting on the safety gear, it was time to begin the boarding process as they say in the airline industry. As advised in the briefing and in the safety video, there is no graceful way to climb into the back of an SNJ-2, which involves a big step up to the wing, then a step up to a small foot peg on the fuselage, followed by a step into the cockpit and a 180 degree turn to plop into the seat. After getting strapped in and comfortable, it was time to put on a helmet and start the GoPro while CT strapped in. 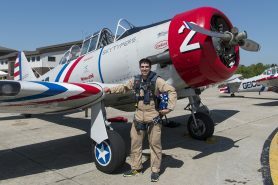 The World War II-era Navy trainer is based on the North American T-6 Texan, and features a beefed up airframe, rounded rudder and, in its original configuration, a tailhook. 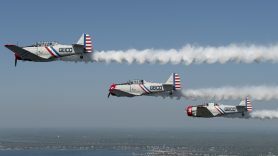 The Skytypers operate six of the 1940s vintage aircraft, each outfitted with a custom smoke system that puts out very thick smoke trails and is connected to a computer that activates the smoke system to form letters when skytyping in a line abreast formation. During the summer, the Skytypers are well known in the New York area, as they print phrases made up of dot-matrix style letters over half a mile tall. In addition to the smoke system, the front cockpit of each aircraft is updated with a panel you’d expect to see in a high end homebuilt or modern general aviation aircraft rather than a 70+ year old radial engine powered military advanced trainer, with a glass PFD from Aspen Avionics and Garmin 430 GPS system. After a few turns of the prop, the 9 cylinder Pratt & Whitney R-1340-AN-1 rumbled to life in sync with the other three aircraft, filling the ramp with the beautiful sound of vintage radial engines. At the completion of preflight checks, the flight leader called for taxi clearance from the tower and the four planes participating in the flight taxied out and performed a run-up. As the pilots spun up the engines, the propwash began to buffet the rear cockpit giving a taste of what was to come. Following the runup, the sweet sound of a takeoff clearance came though my helmet, and CT taxied us out and took the runway aside the #1 plane. As the engines reached takeoff power, a large nod from the leader was the signal to release brakes and commencing our takeoff roll. In a matter of seconds our two-ship was airborne and with the landing gear retracted we climbed away from Runway 34. Beginning a gentle turn over Narragansett Bay, the second pair of aircraft rejoined from below and to the left of our lead two ship, and the photos commenced. The World War II-era planes are well-known for their flights in the skies over the New York area. 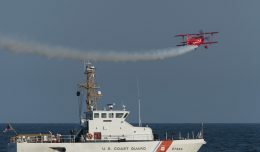 During the next 15 minutes, the Skytyper pilots showed off the SNJs for the embarked passengers, as they smoothly moved through a series of formation changes that not only demonstrated some of the figures displayed during their airshow demonstration, but also put the photographers in great locations to capture photos of the beautiful vintage trainers. The overall grey paint popped well against both the lush green islands as well as the deep blue waters of the bay that served as our backdrop. Having discussed a bit of my aviation interests with CT prior to the flight, I was pleased to hear him narrate a few portions of the formation flight and position changes, giving me the pilot’s perspective on how the markings on the aircraft are used to stay in formation as well as some of the control inputs necessary to fly in close formation with the other three aircraft. It was a real treat to not only have a personal narrator in the front seat describing the maneuvers on the intercom, but also to hear each and every radio call for position changes, smoke on/off, and other assorted check ins among the aircraft. 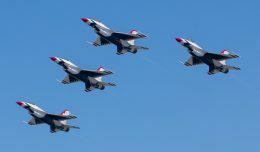 It’s one thing to hear the radio calls on a scanner while standing at show center, and it is another to hear them inside a helmet while flying mere feet from three other aircraft and feeling the plane transition between the various positions in the formation. From the preflight safety briefings to the crisp radio calls, and the outstanding formation flying, it was abundantly clear why the Skytypers are so well regarded by the FAA and the airshow industry as a whole. The level of professionalism and dedication was on display, and it was a true privilege to witness that firsthand. All too soon it was time to head back to Quonset Point. 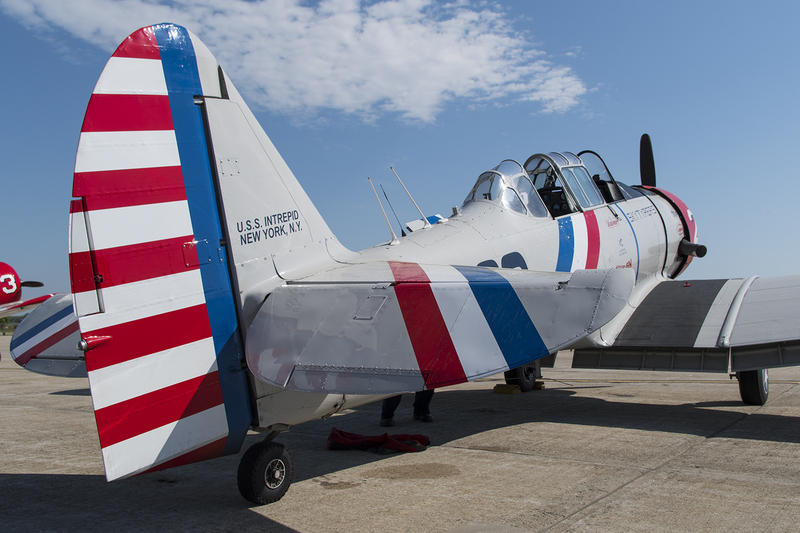 Not only did the Skytypers have to prepare for their afternoon performance, but other performers needed the runway and airspace to practice for their demonstrations as well. As the team aligned with the runway for a pitch up break to land, I set the cameras down and just took a moment to look around and try to take in the experience that I was fortunate enough to be a part of. Looking around from the bay off our right wing, to the rear cockpit, to the three other Skytypers off the left wing, there was truly no bad place to look. 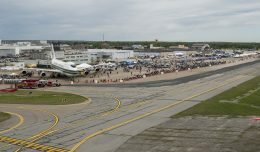 With 2,400 horses of Pratt & Whitney radial power rumbling through the skies over Rhode Island, and 150+ knots of slipstream passing over and around the opened canopy, it was hard to not smile. 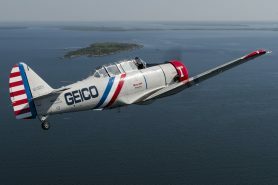 To experience close formation flight in historic 75+ year old training aircraft is a once in a lifetime experience, and to do so over a scenic New England bay and airport once home to a Naval Air Station, was icing on the cake. Coming over the runway, Skytyper 1 turned on the smoke and peeled up and away from the formation. Seconds later I was pressed into the seat by CT’s 3g pitch up followed by a steep banking turn away from the runway to enter the downwind leg of the pattern. With an understanding of the principal behind a formation pitch up to land, and having seen the maneuver countless times at both airshows and spotting days, it was a treat to finally get to experience the maneuver firsthand and seeing how the dynamic maneuver correctly spaced out the aircraft was a real treat. Turning base and final, the reduced throttle setting gave me the opportunity to lean my head out the side of the canopy confines just far enough to get a view of the runway. Despite the stiff breeze, the touchdown was smooth and controlled, and all four aircraft formed up at the A2 taxiway and headed back to parking. As we pulled into the ramp and the props slowed to a halt, it was hard to not reflect on what an incredible experience the last half hour had been. After chocking the plane, and taking a few photos (Thanks Chris! ), it was time to shrug off the gear and go back to being a normal ground based airshow photographer. 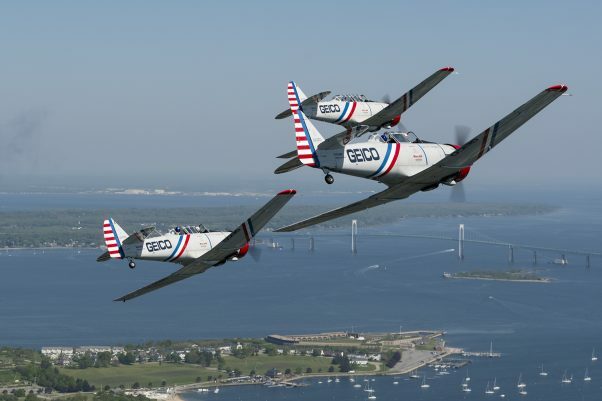 It was truly and honor and privilege to take to the air with the Geico Skytypers, and the memories made on that Friday morning in Rhode Island will certainly live with me forever. To each and every member of the Skytypers organization, the author would like to send a heartfelt thank you, with special mentions to Brenda Little and Steve Kapur for helping to make the flight possible, and to Chris Thomas for giving me the ride of a lifetime in the back of Skytyper 2. Today it’s GEIOCO – back in the ’50s it was skytyping for Pepsi. The planes were BT-13’s. The instrumentation was crude and the smoke generating equipment cantankerous. But is sure was impressive! 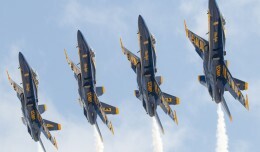 Wow ………really nice Airshow review . when i was reading this review just strange and feeling adventure.